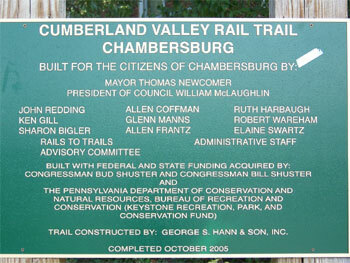 The Chambersburg section of the Cumberland Valley Rail Trail, a 1.6 mile linear park, provides opportunities for walking, jogging, biking, dog walking, skateboarding, and rollerblading. 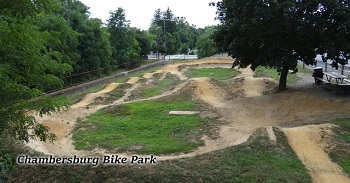 Located between Commerce and South Main Streets, the trail encompasses the natural scenic section between Commerce and King St. (which now includes the new Chambersburg Bike Park, which has a Pump Track and a Jump Track for bicycles). 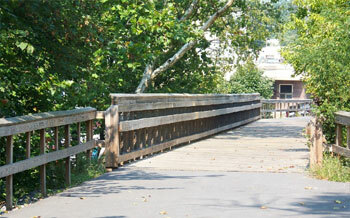 The trail passes the Ice Cream Station at Lincoln Way West, crosses the Conococheague Creek, and continues through the South Gate Shopping Plaza to conclude at South Main Street. 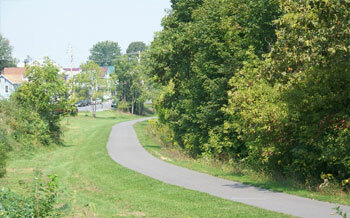 The Rail Trail is mainly used for recreation but many people use to trail to get to work or just to move through town.